The Royal Commission needs to hear from people who were sexually abused as children while in the care of institutional organisations. Private organisations, like churches, sporting clubs, recreational groups etc. Public organisations run by commonwealth, state or territory governments. These institutions might have been providing child-care, accommodation, education, training, cultural or sporting opportunities or some other services. Abusers may have been teachers, scout leaders, priests, carers in a children’s home or others in positions of power. We’ve paraphrased things a little here to make it all easier to understand. If you have some specific questions about your individual circumstances, you can read through the full terms of reference of the Royal Commission. If you’d like to give evidence to the commission but you’re not quite sure if your case fits the criteria – be sure to contact the Kelso’s team. We’ll listen to your story and work out the best way for you to progress. Even if your case falls outside the boundaries of the Royal Commission, we should still be able to help you. If you are the victim of physical or emotional abuse, or sexual abuse outside of an institutional context, you can still tell us your story. Even though you might not be able to give evidence at the Royal Commission, you can still fight for an apology, compensation and justice. Will it be hard to tell your story? 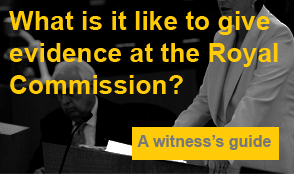 Questioning yourself about giving evidence to the Royal Commission? It’s always difficult to weigh up the emotional costs of revisiting your pain against the benefits of helping yourself and others to fight for justice. We always ask clients how they feel about the process of telling their story. Typically, they say it was nowhere near as difficult as they expected. Often our clients feel better after talking with us. Peter has a personal understanding of the pain and trauma that victims live through. He explains why sharing your story is not as intimidating as you might expect. I have spoken to many people who have been abused as children, so I understand a great deal about the disturbing things that paedophiles do. This helps me to ask appropriate questions, which will make it easier for you to tell your story. As someone who grew up as a ward of the state, physically and emotionally abused by the people entrusted to raise me, you can rest assured that I understand better than most. You can be confident that I’m not going to judge you, doubt you, or think less of you, regardless of what deviant behaviour occurred. I will use what you tell me to support any later claims for compensation. This means that after you have finished with the Royal Commission, you may never have to tell your story again. If you’re thinking about giving evidence to the Royal Commission, now is the time. Tell us your story and we’ll help you along your journey to justice, once and for all. If you’re thinking about giving evidence to the Royal Commission, tell us your story and we’ll help you along your journey to justice, once and for all. The Commission is gaining momentum and calling for victims and witnesses to come forward. You can be a part of the fight to make sure this can never ever happen again.